Anonymous, 01 Apr 2019I'd like to add, Google's night sight feature has been ported on the sub $300 Pocophone F1. An... moreFirst, you should look at the Verge's comparison between the P30 Pro and the Pixel 3, which has Night Sight. Night Sight is utter trash compared to Night Mode from Huawei. Night SIght can't even compare to AUTO MODE on the P30 Pro. Second, I HAVE a DSLR and a P20 Pro (P20 not P30) and I wouldn't hesitate to use the P20 Pro for all my travel photography. Some people just don't understand few want to lug a big camera with them everywhere. Corning® Gorilla® Glass has been designed into more than 6 billion electronic devices. Because of non-disclosure clauses in some of our customer contracts, we cannot identify all the devices that feature Corning® Gorilla® Glass, so we encourage you to contact the manufacturer of your device. If you would like to know which devices do use Gorilla Glass or to learn more, you can visit our website at www.CorningGorillaGlass.com. Anonymous, 06 Apr 2019Something even better than gorilla. It is secret and that is why they do not want to publishThat what I am searching. It's seems no one have any idea. stefan, 01 Apr 2019I have bought P30 pro with Huawei Watch GT promotion. And the watch doesn't have google maps... moreWait really.. Even my huawei watch 2 has g maps.. U should download it from the playsyore in your watch if it is not preinstalled. Anonymous, 01 Apr 2019It's your choice if you think a $1,000++ photo specialist flagship phone is worth it. I'm jus... moreUse those "hyped" camera centric overpriced smartphones then compare with your phone and you'll know their differences. "By the way, the selfie shooter appears to be centered but it isn't, and you can tell if you look closer. The camera is about 1 or 2 mm to the left side, so if imbalances bother you, consider yourself warned." Mine is 1 mm to the right side ! I don't think on other flagships their is such " default "
By the way, for owners, do you also have such ultra-mega processing pictures when you shoot ? When i use the X5 zoom, the pictures sound so processed ! The NM card is not an issue. On my Mate20 Pro when I wanted to load all my music and books from a laptop I took the SanDisk microSD card out of the laptop and put it in the $30 Huawei NM/microSD Reader. I put that in the phone's Type C port, opened Files and copied everything in one go over to the NM card on the phone. I could also have put the NM card into the reader, plugged that in to my laptop and used Windows 10 file features to copy over to NM card. The Reader has a Type C on one end and a regular USB on the other, plus one microSD slot and one NM card slot. So it is really simple and not an issue to have a smaller form factor storage card. And we will probably see a lot more of them as it becomes an open standard and other manufacturers make them, bringing the price down. Anonymous, 04 Apr 2019Am i the only one seeing vertical purple lines on the screen ?????? i guess screen is faulty.... moreThose purple bands? Yes, I see them. They are amoled screen refresh lines. If the camera used to capture the photo of an lcd or amoled screen has a faster shutter speed than the phone display's refresh rate, you are going to see those bands. What type of gorilla glass the P30 Pro uses on the front and back glass ?? Mike13Fr, 02 Apr 2019I am really skeptical about this new phone...i don't care about screen resolution, i don't car... morePlease try to watch jack rig everything videos, you will know it has glass protection it's not a must it comes from gorilla so long as it is protected. Anonymous, 04 Apr 2019Am i the only one seeing vertical purple lines on the screen ?????? i guess screen is faulty.... moreNah...thats a screen framing captured on camera (especially on OLED). U will not see it in real life. Am i the only one seeing vertical purple lines on the screen ?????? i guess screen is faulty. Mike13Fr, 02 Apr 2019I am really skeptical about this new phone...i don't care about screen resolution, i don't car... moreas far as i know these phones uses gorilla glass. so??? 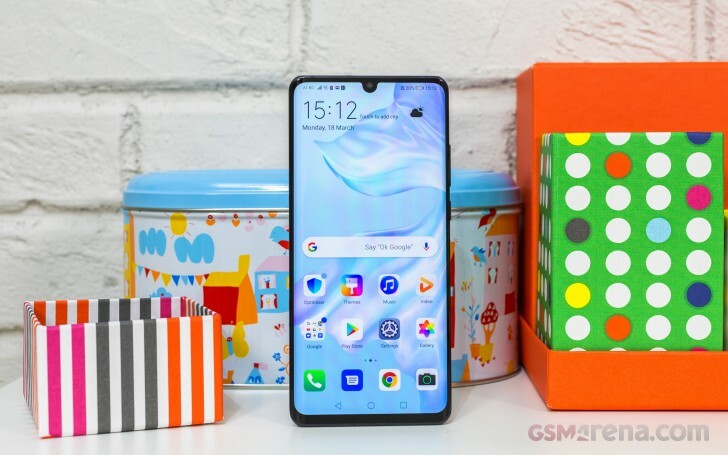 I am really skeptical about this new phone...i don't care about screen resolution, i don't care about 4K videos, i don't care about jack.. but Huawei... why you did not include screen gorilla glass ??? this would definitively be an issue ! you can not as customer purchase a 1000 EUR phone without being on a safety side with the screen. It's totally stupid from the Huawei team budget priority. Anonymous, 01 Apr 2019Look, you're becoming emotional. Just because I criticize Apple's predatory $1,000++ iphone pr... moregood to know you're also recommending the flagships, thats what i wnna hear from you all these times. youre impression on me is that you purely for midrange and against flagships. but yes, consider yourself ignored. tho, i wont know if its you since your anonymous, lots of anonymous here in gsmarena. lol. realitychecker, 01 Apr 2019okay. my only question is why are you so biased against huawei and other expensive brands? it... moreLook, you're becoming emotional. Just because I criticize Apple's predatory $1,000++ iphone pricing and do the same for android flagships copying Apple's $1,000++ pricing strategy doesn't mean I don't recommend them for users who really are brand conscious and image conscious especially if they have money to burn. For the vast majority though, especially for the poor hapless ones who really should be saving the money instead for more important things, I share my insights based on my smartphone and photography learnings and experiences. If you don't like that, just ignore my comments. Gsmarena is a free speech site.